LONG BEACH — The Long Beach Board of Harbor Commissioners gave preliminary approval Jan. 23 to a 40-year, $4.6 billion lease with Orient Overseas Container Line (OOCL) that includes the port’s largest-ever terminal upgrade and expansion: the Middle Harbor Project. The board’s Finance and Administration Committee’s 3-0 vote of approval has cleared the way for a final vote by the Long Beach Harbor Commission on the largest terminal deal of its kind for any U.S. seaport. The lease has been agreed to in principle by Hong Kong-based OOCL and its U.S. subsidiaries, OOCL LLC and Long Beach Container Terminal. “This agreement represents a major endorsement of our vision for the port by one of the leading maritime companies in the world,” said Port of Long Beach executive director J. Christopher Lytle, who made the announcement during the annual “State of the Port” address Jan.19 at the Long Beach Convention Center. The port is investing $1.2 billion to develop the new 300-acre-plus Middle Harbor Terminal, while OOCL and Long Beach Container Terminal will invest approximately $500 million in the latest cargo-handling equipment. The Middle Harbor Redevelopment Project would combine Piers F and E into one state-of-the-art container terminal. 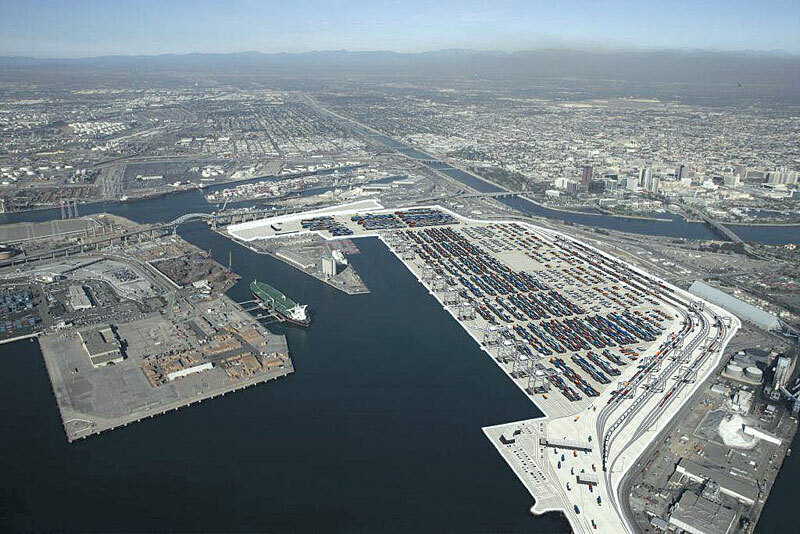 Long Beach Container Terminal has occupied Pier F since 1986 and would operate the Middle Harbor Terminal. The project is projected to generate more than 14,000 jobs throughout Southern California by 2020, and at its completion, would have the capacity to handle 3 million cargo containers — effectively doubling the terminal’s existing capacity. With a fleet of 84 owned and chartered ships, OOCL is the world’s 12th-largest ocean shipping line. Despite the down year for cargo at the Port of Long Beach, and with the move of Hyundai shipping line and its California United Terminals to the Port of Los Angeles, OOCL committed long-term to the Port of Long Beach. With Hyundai out of the mix, OOCL is poised to take over the entire upgraded Middle Harbor terminal, which is currently receiving sediment from outside sources such as Newport Harbor and Marina del Rey to fill in approximately 54 acres of water area between the shipping terminals of Piers F and E. When the Middle Harbor Project is complete, Long Beach could replace Los Angeles as the nation’s busiest seaport. Long Beach moved around 6.1 million cargo containers last year, compared to the Port of Los Angeles’ 7.94 million 20-foot equivalent units (TEUs). With the added 3 million in capacity at Middle Harbor, the Port of Long Beach could potentially see 9 million TEUs pass through its terminals. The new terminal is also planned to be one of the “greenest” in North America, cutting air pollution in half through the use of more on-dock rail, electrified cargo handling equipment and shore power, which allows vessels to draw electricity from a landside utility when docked rather than diesel-powered auxiliary engines. With 140 shipping lines connecting Long Beach to 217 seaports worldwide, the Port of Long Beach handles trade valued at more than $155 billion each year. OOCL was the first Asian shipping line to transport containerized cargo across the Pacific and continues to be one of the leading international carriers serving China. It provides a full range of logistics and transportation services throughout the country.